We’d love your help. 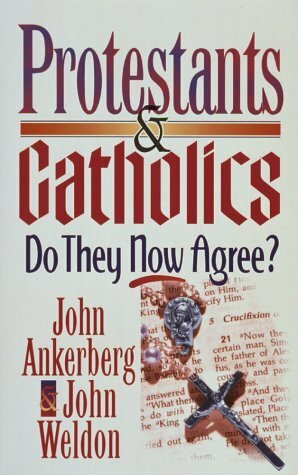 Let us know what’s wrong with this preview of Protestansts and Catholics by John Ankerberg. Protestansts and Catholics: Do They Now Agree? Examines the questions that people are asking regarding efforts to unite Catholics and Protestants. Compares God's Word with the current teachings of the Catholic Church. To ask other readers questions about Protestansts and Catholics, please sign up. Thought provoking book. Why do Baptists hate Catholics so much and why do other Christian religions spend so much time worrying and disapproving of Catholicism? This book was given to me to read by some aquaintances who are Baptist. John F. Ankerberg (born Dec 1945) is the host of a nationally syndicated evangelical Christian television talk show. The show is broadcast from Chattanooga, Tennessee via satellite and highlights contemporary Christian viewpoints and debates among well known Christian scholars. Ankerberg holds a Doctor of Ministry degree from Luther Rice Seminary and is an ordained Baptist minister. He is the autho John F. Ankerberg (born Dec 1945) is the host of a nationally syndicated evangelical Christian television talk show. The show is broadcast from Chattanooga, Tennessee via satellite and highlights contemporary Christian viewpoints and debates among well known Christian scholars. Ankerberg holds a Doctor of Ministry degree from Luther Rice Seminary and is an ordained Baptist minister. He is the author or co-author of numerous books including Darwin's Leap of Faith: Exposing the False Religion of Evolution (Harvest House, 1998), and The Secret Teachings of the Masonic Lodge: A Christian Perspective (Moody, 1990).